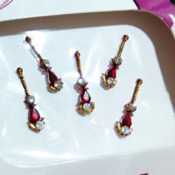 They can be placed anywhere on the body as body jewelry - for e.g. 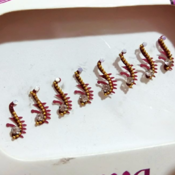 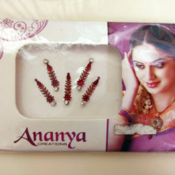 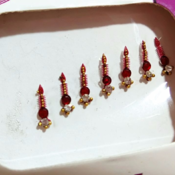 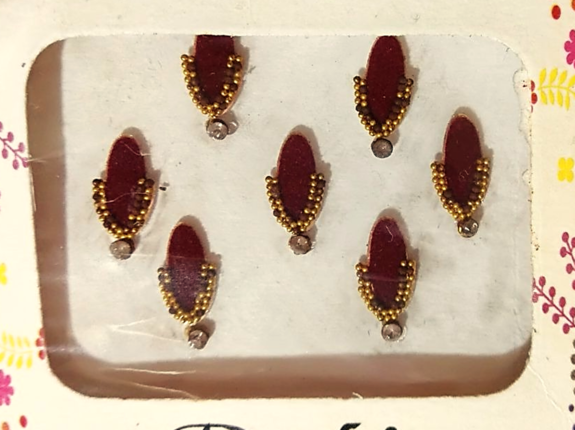 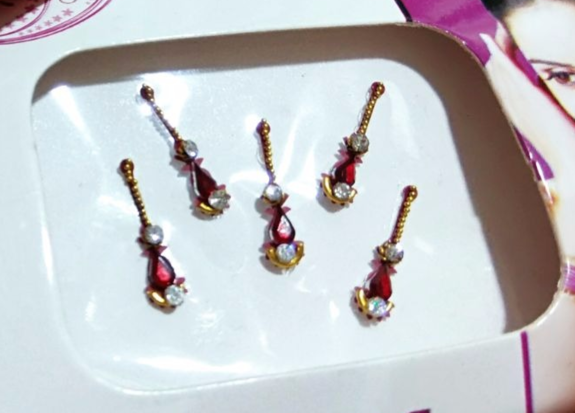 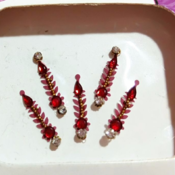 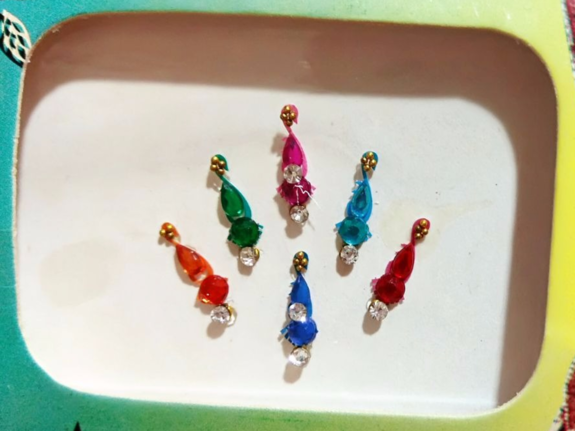 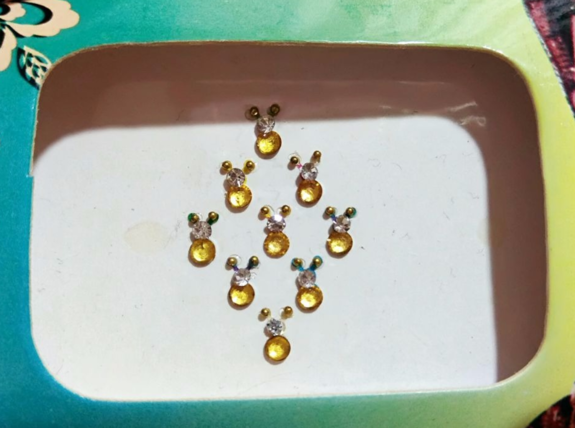 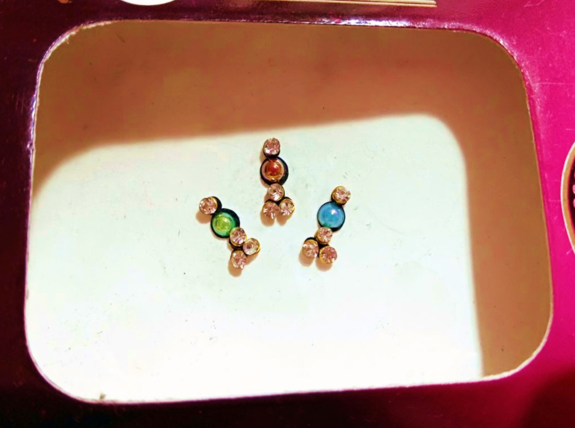 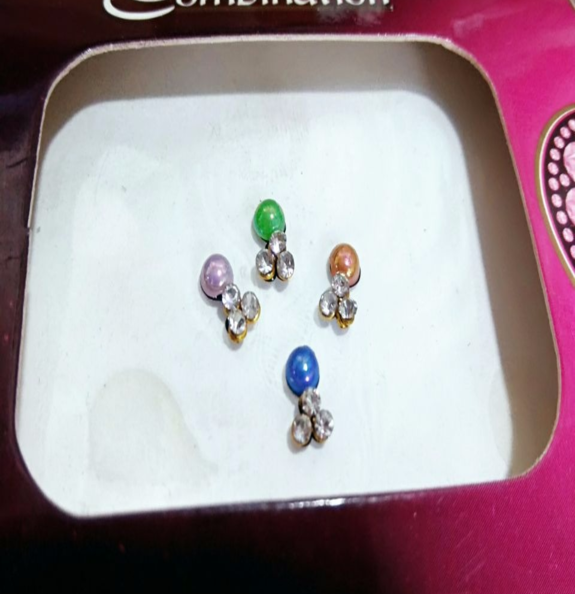 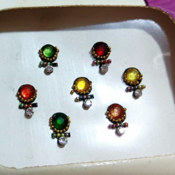 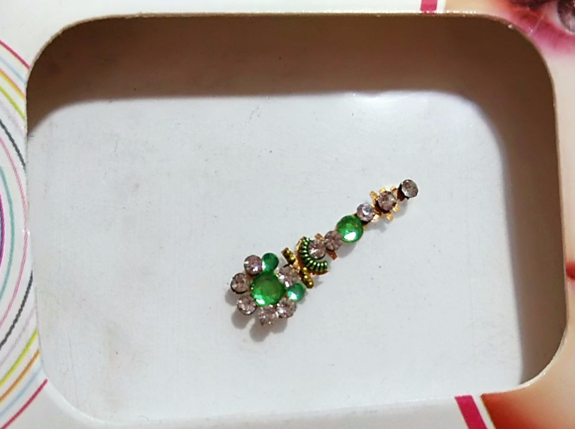 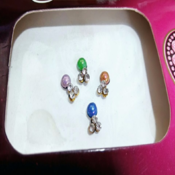 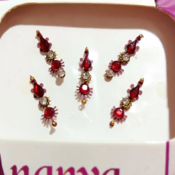 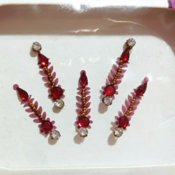 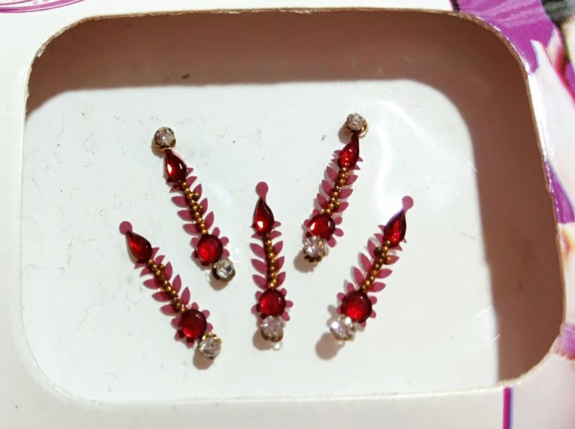 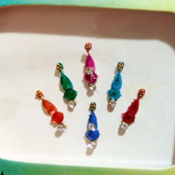 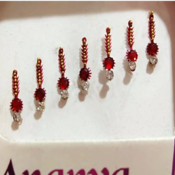 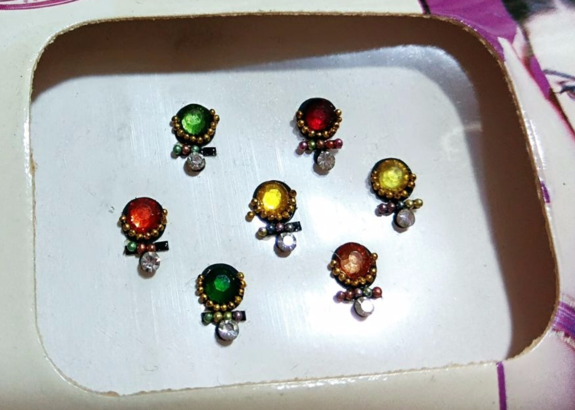 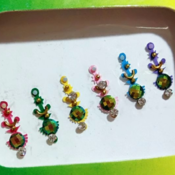 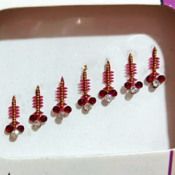 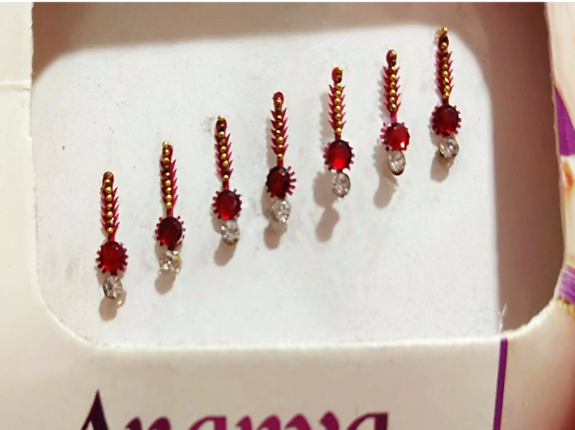 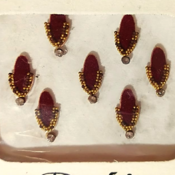 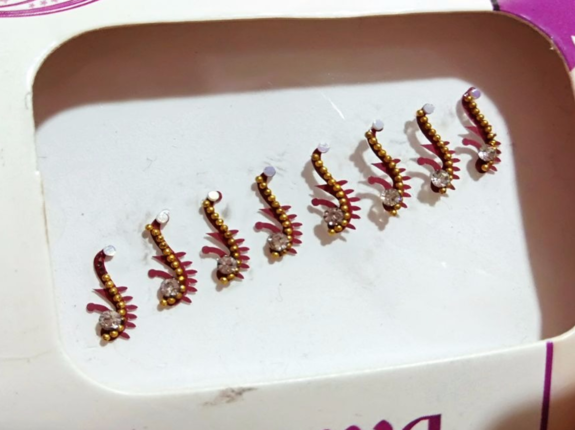 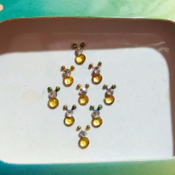 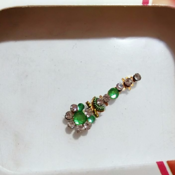 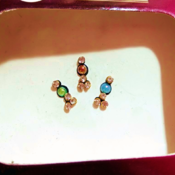 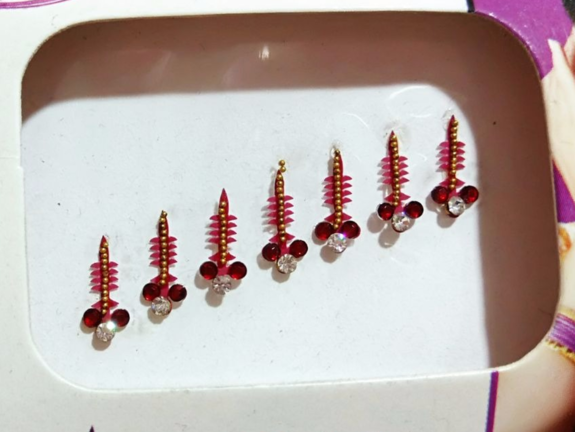 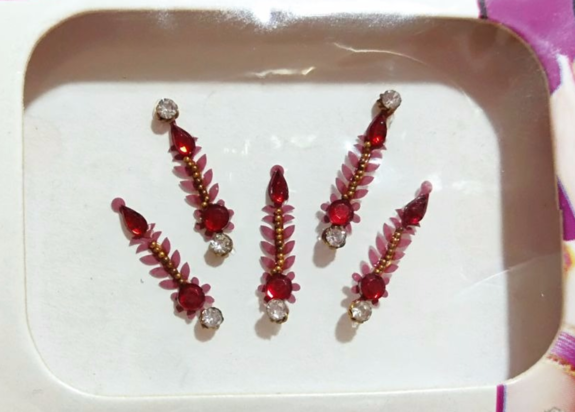 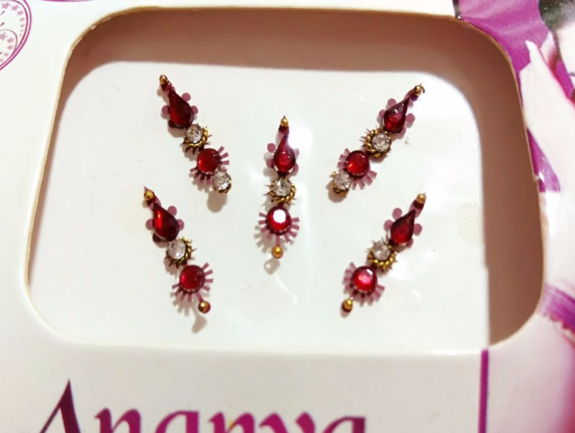 like a jewel on the throat, on ears to look like earrings, as nail art and as doll jewelry ~ can even be used to glam up cell phone cases and arts and crafts projects. 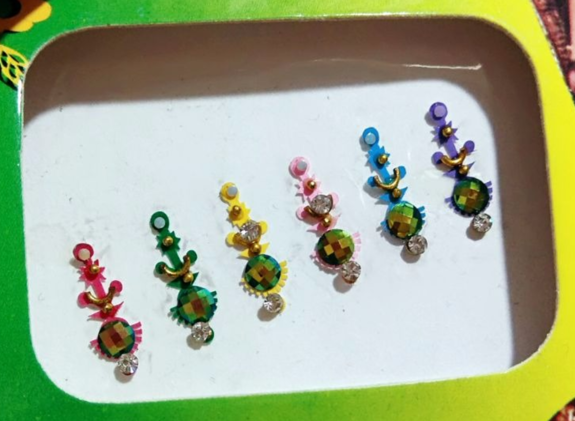 Stick-on, can be used repeatedly. 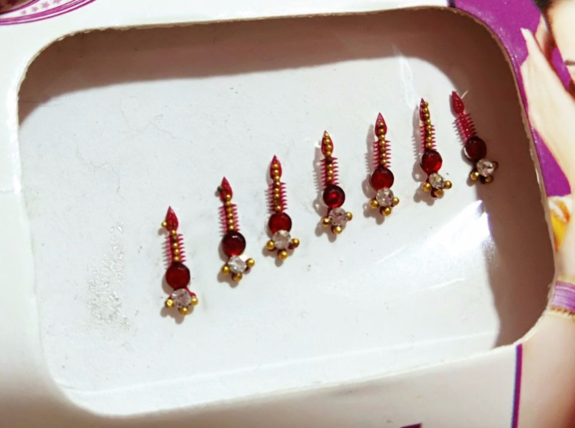 A Bindi (Hindi: बिंदी, from Sanskrit bindu, meaning "point, drop, dot or small particle") is a red dot worn on the center of the forehead, commonly by Hindu and Jain women. 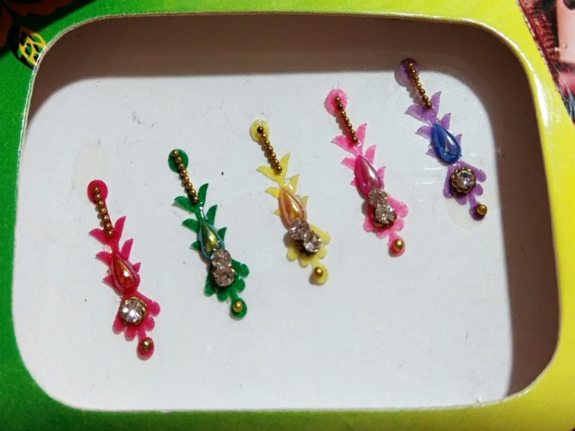 Bindis are popular outside South Asia and Southeast Asia as well. 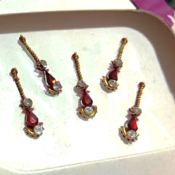 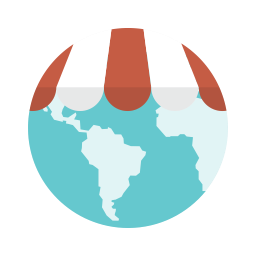 They are sometimes worn purely for decorative purpose or style statement without any religious or cultural affiliation. 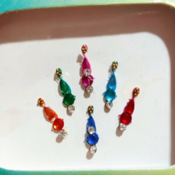 Bindu is considered the point at which creation begins and may become unity. 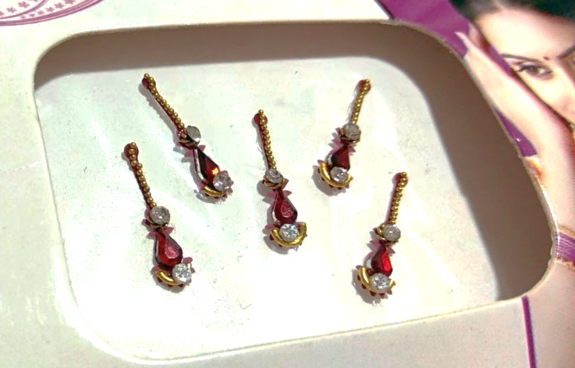 It is also described as "the sacred symbol of the cosmos in its unmanifested state". 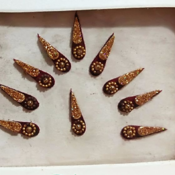 A Bindi is a bright dot of red colour applied in the centre of the forehead close to the eyebrow worn in the Indian Subcontinent (particularly amongst Hindus in India, Pakistan, Bangladesh, Nepal, and Sri Lanka) and Southeast Asia among Bali and Javanese Hindus. 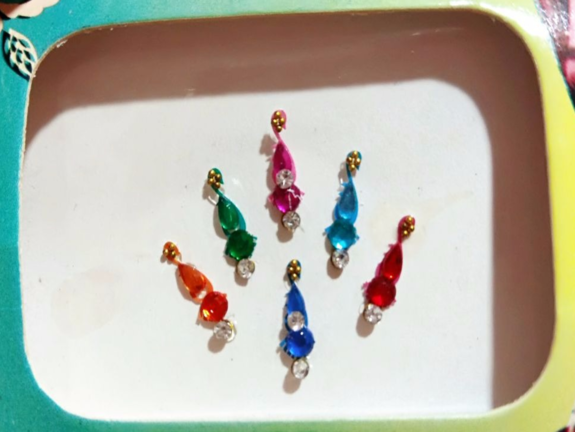 Bindi in Hinduism, Buddhism, and Jainism is associated with Ajna Chakra and Bindu is known as the third eyechakra. 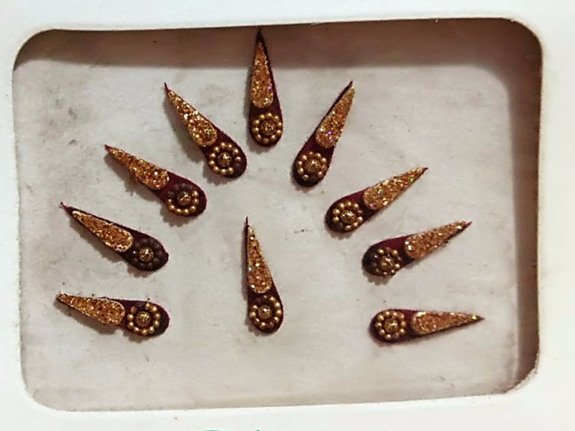 Bindu is the point or dot around which the mandala is created, representing the universe. 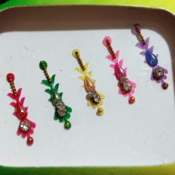 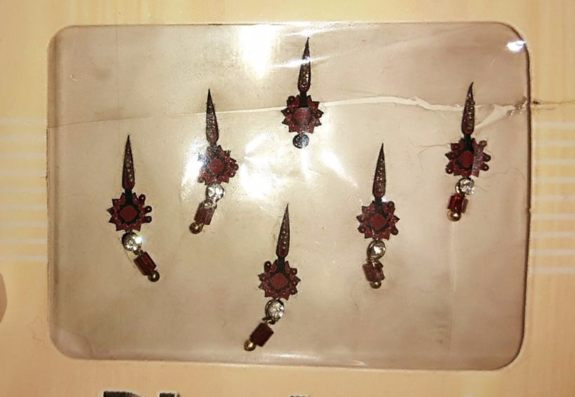 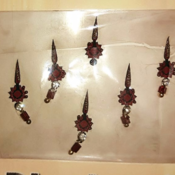 The Bindi has a historical and cultural presence in the region of Greater India.